Tokyo’s a big city with big weather – it regularly gets hit by typhoons, and it has a month-long rainy season every year. So it should come as no surprise that its flood defence system is big too – but you really need to see it in person to appreciate just how big Tokyo-big is. 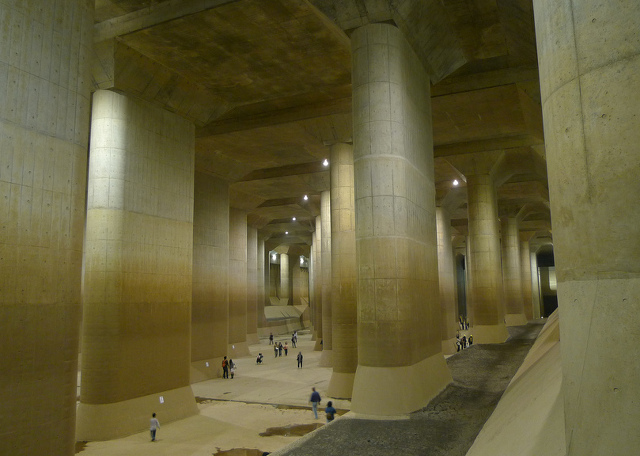 Fortunately, this gargantuan construction is open to the public on a regular basis, so visitors to Tokyo are able to spend some of their holiday inside the world’s biggest sewer. 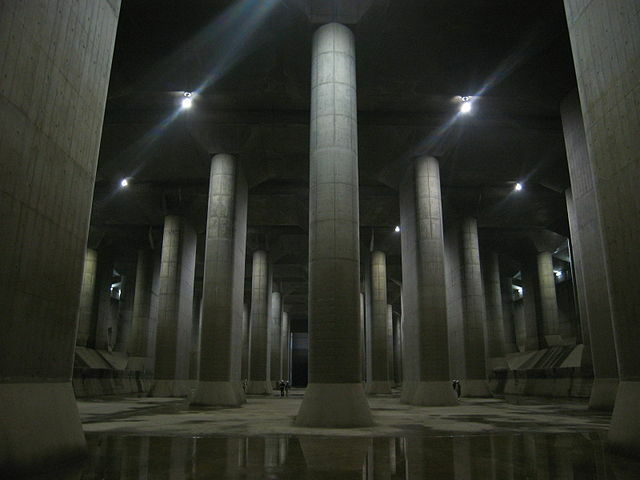 The G-Cans Project, or the Metropolitan Area Outer Underground Discharge Channel, as it’s more correctly known, consists of five colossal silos, connected by a six and a half kilometre-long tunnel that leads to a huge underground storage tank. Each of the silos is close to a different river, and when that river overflows, it absorbs the excess water that would otherwise flood the surrounding area. From the silos, the water flows into the tunnel, and downhill to the storage tank, where it can be kept until the water levels in the rivers start to go down. The water is then pumped out into the nearby Edogawa river. What makes G-Cans special is its scale. Each silo is 65 metres high and 32 metres in diameter. The staircases that snake down their sides look positively Lilliputian in comparison. Even the tunnel, which runs 50 metres underground, is over 10 metres in diameter. 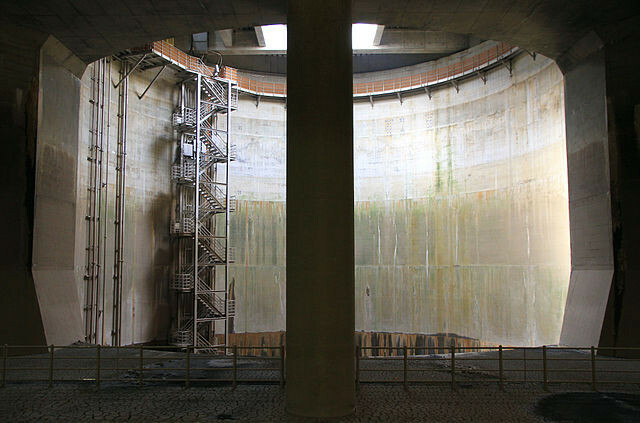 But the real giant among giants is the storage tank – it’s 177 metres long, 78 metres wide and 25 metres high. The roof is supported by 59 massive pillars. Standing on the floor of this behemoth, which is popularly known as ‘the temple’, you can only be in awe of its scale. Visitors look tiny when seen next to the giant pillars, and the whole impression is of something out of a sci-fi or fantasy movie. Some people have suggested that this ¥230 billion project is something of an overkill – perhaps designed more to line the pockets of Japan’s construction industry than to keep anyone’s feet dry, but there was certainly a need for something. In 1991, two years before construction began, 30,000 homes around the northern fringes of Tokyo were flooded by a typhoon, and it was predicted that a once in two hundred year extreme deluge would flood almost 100 subway stations. G-Cans took 17 years to build, and since its completion in 2009, it’s massively reduced flooding. No doubt Tokyo residents whose homes frequently used to end up underwater think it’s money well spent. The temple gets its name because of its resemblance to an ancient Greek temple. Visitors only get to see it when its empty, but it would make a great swimming pool when it’s full up. Tours of G-Cans are popular with people of all ages, including plenty of children. They’re conducted in Japanese, but you won’t miss much as the commentary is really boring and repetitive. Each tour starts with a video and a look at an exhibition, before getting to the good part – entry to the temple. You go in through a small concrete building that slants into the ground. Inside a staircase winds down and down, eventually emerging on one side of the giant chamber, from where you can descend to the floor. You’re not allowed inside the silos or the tunnel – they’re for employees and VIPs only – but you do get a good view of one silo, which is adjacent to the temple. Tours run three times a day, Tuesday to Thursday, and last an hour and a half. They can be booked via the official website, but you must be accompanied by someone who can speak Japanese, so they can translate evacuation instructions in case of an emergency. Tours begin at the pump station in Kasukabe City, just metres from the banks of the Edogawa river. It’s about 35 kilometres north of central Tokyo, and can be accessed from Minami Sakurai Station on the Tobu-Noda line. The journey takes around an hour and ten minutes by train, then it’s around half an hour’s walk.